Hi friends! It’s Liz from Love Grows Wild, and I’m back again with another tasty dish for you! Now that Thanksgiving is just around the corner, my mind has been consumed with food ideas for the holidays. Last week I shared a whole slew of holiday recipes on my blog, including some delicious roasted fall vegetables, a slow cooker recipe for butter & herb turkey (yep, I cook my turkey in a slow cooker! ), and even some pecan pie muffins. You can officially say I’m holiday-food obsessed! Oh, and you can’t forget about the BEST green bean casserole ever with fresh mushrooms and homemade crispy onion strings I shared last time I was here! I have a feeling I’m going to gain 20 pounds this season! 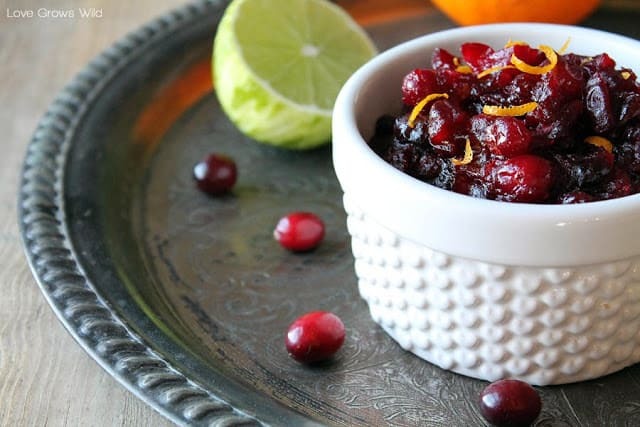 So in keeping with the holiday theme, today I’m sharing with you this delicious recipe for Orange and Lime Cranberry Sauce! So if I’m being completely honest, I never really ate cranberry sauce growing up. We usually had the canned stuff that never appealed to me much. But as I started learning to cook, I wanted to try making my own cranberry sauce, and boy I didn’t know what I was missing all these years! 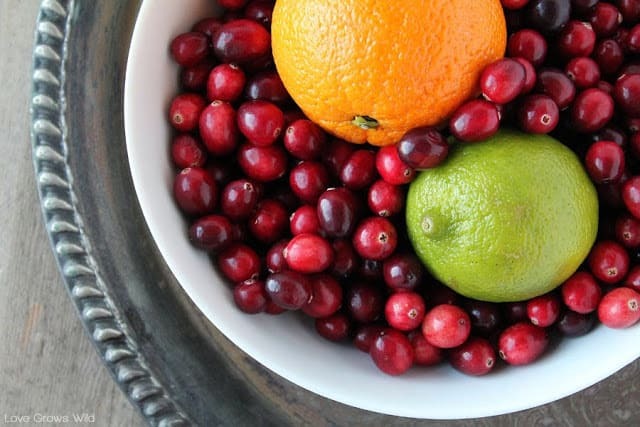 Fresh cranberries are so flavorful, have such a pretty color, and really are simple to cook. Preparing the cranberry sauce consists of throwing everything in a saucepan and cooking it until the cranberries burst and the mixture becomes thick and syrupy. That’s really all there is to it! And what’s great about this easy side dish is you can cook it up to 2-3 days ahead of time, and keep it in the refrigerator until the big day! I love prep-ahead recipes! 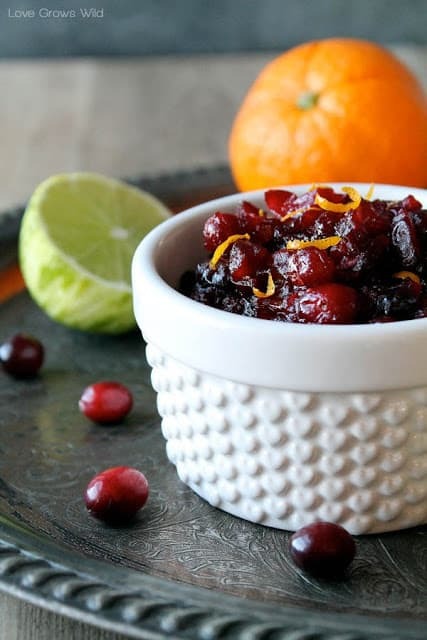 Simple, plain cranberry sauce is delicious, but adding in the fresh, bright flavors of limes and oranges… Amazing! Not only does it give the sauce a wonderful citrusy flavor, but it makes for a gorgeous presentation as well. Just sprinkle a few extra wisps of orange zest on top of the ruby red berries before serving, and your guests will ooh and ahh over your beautiful recipe! Add cranberries, brown sugar, water, and cloves to a medium saucepan over medium heat. Bring to a rapid simmer and cook until the cranberry skins burst and the mixture becomes thick and syrupy, about 10 minutes. Stir in lime zest, orange zest, lime juice, and orange juice, and season with salt to taste. 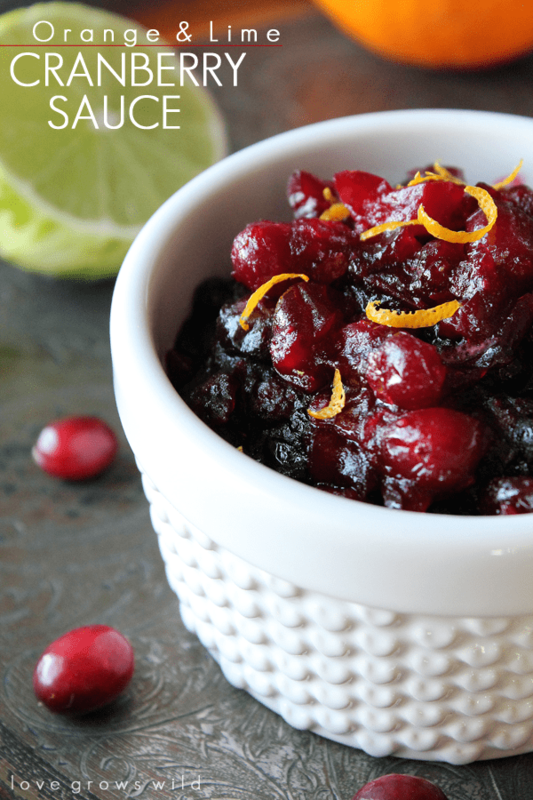 Let cranberry sauce cool to room temperature before serving. Garnish with extra orange zest for presentation. - Cranberry sauce can be prepared up to 3 days ahead of time and refrigerated. Please note, it might be advisable to remove the “whole cloves” before serving. Just made this for Thanksgiving today and it’s a winner! So tasty and so easy! Forget the canned stuff, for good! This was great but I had to add a little more sugar as it had a bit more of a bitter taste than I would have liked. Probably my own fault though as I may have went a little overboard with the zest. This was SO good! My very picky 20 year old didn’t even touch the jellied cranberry sauce I had on the table for Thanksgiving because she liked this so much! No leftover sauce – I had to make more to have with dinner leftovers.